Bodog sportsbook was one of the most active online, and one of the locations most favored by US online gamblers. But thanks to bureaucratic posturing, they had to close their doors to US players. However, always known for providing competent and responsive customer service, and placing its players first, Bodog simply launched a sportsbook in a jurisdiction which allows US players and opened their doors as the Bovada Sportsbook. The same legendary Bodog customer service, same favorable odds, and same trustworthy payout system is in place, with the new Bovada name. Offering an attractive 50% bonus on your initial deposit up to $250 for 2018, and extras such as your choice of American Odds, Fractional Odds or Decimal Odds, Bovada has put in a lot of effort to stand out to US bettors. And all standard bets are available as well as Sweetheart Teasers, Cross-Sport Teasers, If bets, Reverses, and Round Robins. As mentioned above, Bovada offers a 50% Free Bet bonus on your initial deposit up to $250. Once your initial deposit is processed, your free bonus bet will be available within 30 minutes. To use your Free Sports Bet, go to your My Account tab, and ensure that the bonus is active. Add your qualifying bet to your Bet Slip just as you would a regular bet, review your bet, check the open box for Free Bet, click Place Bet, and you are playing with free house money. You can place any type of wager on any sport, with any odds, but you have 30 days from your initial deposit to take advantage of this free bet before it expires. No special bonus code is needed. 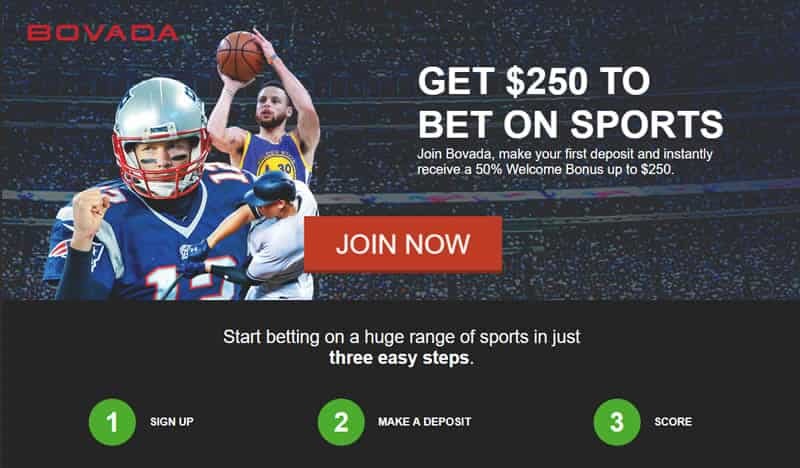 The Bavada sportsbook currently offers no reload bonuses, but they do run random reload bonuses frequently, and will e-mail you when one is upcoming so you can take full advantage of the bonus. Throughout the year Bovada will offer a wide variety of sports-specific and seasonal bonuses and promotions. Make sure you sign-up in advance to the start of the Major League Baseball, NCAA Basketball, NCAA College Football, National Hockey League, National Basketball Association and the National Football League seasons to access the highest odds and props before your favorite sports season begins, as well as take advantage of any seasonal promotions. Like their big brother Bodog, Bovada will feature seasonal promotions for a wide variety of the sports events found in their betting lines. Often times the promotion begins at the beginning of the season and builds each week, leading up to a large event or bonus during playoffs, hence it is always best to check out their promotions at the beginning of any season or prior to playoff events. If you'd like to find out what other types of deposit methods are available, check our page that lists additional USA online deposit methods. Bovada has an easy to use mobile sportsbook that provides an efficient and well designed mobile betting experience. You can expect the same authentic betting experience as you would find in the desktop version of the site with the convenience of betting anytime anywhere. The Bovada mobile site allows users to place bets, check betting lines, withdraw or deposit funds, and everything else the desktop version does. Since the mobile app is web based there is no need for an additional download and security features carry over to mobile devices. Bovada provides betting lines for a wide variety of international professional, and college sporting events. Account holders are almost sure to find the games they want to wager on, especially if they include the NFL, NCAA, NBA, MLB, NHL, FIFA, or other popular leagues. Bovada is also known for providing competitive betting lines for major events such as Boxing, Wimbledon, Masters Golf Tournament, World Cup, Olympics and more. Betting lines dictate payouts based on the wagering option played. Bovada’s betting lines are comparable to what you would find in Las Vegas and better than most of their online counterparts. Bovada’s sportsbook has multiple wagering options that account holders can use to place their bet. Each sport uses various wagering methods depending on the game. The wagering options associated with the Bovada sportsbook are money line, total, spread, parlay, round-robin, Sweetheart Teasers, Cross-Sport Teasers, If bets, Reverses, and futures, prop, and live betting. Bovada offers an online casino, poker room, a racebook, and now live dealer games. Account holders can use their single user account to wager on any of Bovada’s additional services. All of Bovada's services are available to account holders with no additional sign-up or downloads (except poker). Bovada's Poker Room has an additional program download for faster access to the poker table. Bovada offers live in play betting on many sporting events around the world. The live events page offers a slew of live events that are in progress and can be wagered on. After clicking on the live events page, a new window will pull up that holds all the live events. Once on the live betting page, events that are in progress are listed on the side menu. Live events are put into categories and sorted by sports. Upcoming events are also listed and easily accessible. Bovada's live event interface is clean with a players bet slip positioned on the right side of the screen, just like we're accustomed to. Bovada only services the United States at this time. They are part of the international Bodog brand. Bodog has several sites that service specific countries around the world. Are Bettors Required To Accept Bonus Offers? No, bonus offers are for bettors who want to earn additional rewards for their time and money spent. We suggest you check into a bonus offer as they could be beneficial in the long run, but there is no obligation to sign-up for a bonus reward. Does Bovada Offer A Rewards Program For Their Casino, Racebook, Poker, And Live Dealer Games? Yes, the rewards system extends to all their platforms. The more a player bets, the more points a player earns. Points can be redeemed for bonus cash and the number of bonus points earned over the life of an account will determine a player's rewards tier. Can Bonus Funds Be Withdrawn? Yes, but wagering agreements must first be fulfilled. For the Bovada sportsbook, wagering agreements are (5) times over the deposit and the bonus combined.